In short, the Sims Freeplay is a sandbox God game. It differs from all other Sims™ games so far. Mostly noticeable in the absence of 'Free Will' (your sims wait for you when finishing their task), they won't even go to the bathroom if they need to! The game is played with Real Time, when it's 8am in our world, it's that in the Sims Town too. Growing seeds or Baking takes however an unreal approach, potatoes grow in only two hours (if only!). While the game allows you to play in quick bursts, it takes many months to reach level 55. It can be played for free entirely, if you don't wish to spend any real money on it. You only require 'some' patience and persistence. LifePoints can be gathered through fulfilling tasks/challenges and doing hobbies, as well as hoping for your pet(s) to dig one or two up which is rather time consuming. SocialPoints can be obtained by doing tasks at a neighbour's town (you need to connect the game through Facebook and/or Game Center (iOS) or the Windows Phone Gamertag service(?). (I don't own a Windows Phone, so the details on it are vague to me). Please note that once you finish the "Life Dreams and Legacies" quest (available from level 26 onwards), your sims will age and eventually die! You can pause the ageing process, but you'll have to sacrifice the lives of 3 Sims for obtaining one platinum orb which pauses the ageing process of ONE sim indefinitely. Orbs are the hidden currency in the game, they're required to pause sims, but also to build venues (although you can pay with loads of LPs instead as well). The Sims Freeplay can be obtained through Google Play Store (Android devices), Amazon's App Store (Kindle), Apple's App Store or search for "Sims Freeplay" in iTunes (iOS/Apple devices), Windows Phone App Store and other non-official locations (not recommended). 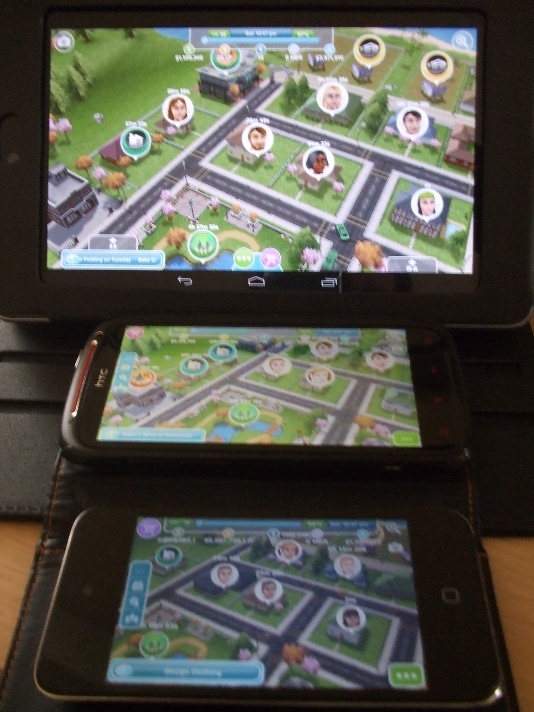 Windows phone users can also play the game, however, they can NOT use Facebook for obtaining neighbours. They have to find friends with a Gamertag (Xbox) account. Windows phone has been unsupported for several updates, but has returned with the Royalty update. The game consists of one or two parts depending on your device, the Base Game which you installed from the app store, and the data part which gets placed on your storage (internal or microSD, OTG is not supported yet). On Android the base game storage also holds your saved game in the device's "/data", which means that you can't back it up directly without having rooted your device. The only off-device 'backup' possibility is using the cloud storage, which requires a Facebook account. While it's published in the various app stores through EA, the game and its contents are created and maintained by Firemonkeys. This means that when Firemonkeys ships out an update, it can take a while before showing up at the EA servers. Base Game updates (for the app you installed) come through the app stores, which varies greatly in availability if the app store is neither Google, nor Apple. I highly recommend to make a backup (in the cloud) before installing an update. On Android: Facebook account allows you 1 cloud backup (to the Firemonkeys servers). Game Center allows you 1 cloud backup (to the Firemonkeys servers, NOT iCloud), using Facebook in combination with Game Center will cause the accounts to be linked. However, if only logged in with Game Center AFTER the accounts have been linked, you might see your last Game Center Only cloud saved game. This is rather confusing! Moving saved games between Android and iOS devices can be done only with a Facebook account. I play the game with different tactics currently on several devices, (2) Google Nexus 7, Asus Transformer, Nexus 4, Minix-8, and HTC Sensation XE, all Android devices. I also have access to an iPod Touch for some Apple experience. A word of warning about time-cheats: once you start to use time-cheats you will have problems arising later on. I strongly advice against using any cheat! Important: Cheated games will receive no support from Firemonkeys/EA when found out. Buildings taking significantly longer times to complete. Sims and babies taking significantly longer times to arrive. Sims no longer attempting to attend work. No longer receiving your daily mailbox reward. Daily Party Boat gifts taking significantly longer to arrive. No longer having access to timed events or special limited edition awards, including that of future updates. We would like to take this opportunity to remind you that if you change your phone’s date settings, you may experience these issues as a side effect. Connecting to the Online Store. Connecting to the Party Boat, accessing your leaderboard and gifts."